First, it enhances oxygen transfer rates by “sheering” the water and creating large quantities of fine bubbles for better oxygen transfer. An abundance of bubbles created in this process are the key to enhanced oxygen transfer efficiency, commonly referred to as the Standard Aeration Efficiency (SAE). The more fine bubbles created, the more the overall surface area is increased, which allows the bubbles to capture the oxygen in the air and dissolve this oxygen into the wastewater. ECS House Industries’ unique blade and “tip” design, along with the rotor speed, provides the best oxygen transfer among other floating brush aerators. THE FLOATING BRUSH AERATOR SYSTEM CAN DECREASE YOUR ELECTRICITY COSTS. IN THE CASE OF BELL CARTER, USING THIS TYPE OF AERATION SAVED THEM $323,000 OF ELECTRICITY COST OR 2.7M kWH/y OF ENERGY. 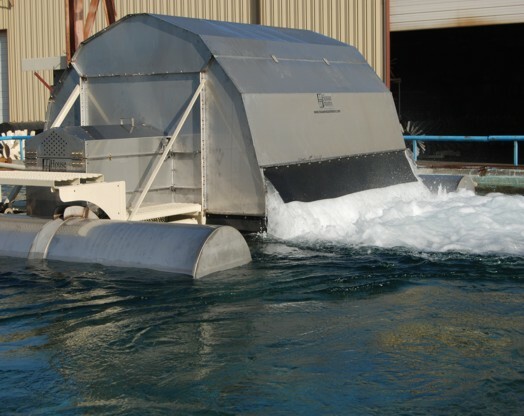 The floating brush aerator provides effective and efficient wastewater treatment through superior oxygen transfer and mixing rates, leading to increased performance using less horsepower. Additionally, our pumping rates range from 3,000 gpm/hp to 3,800 gpm/hp depending on the aerator size and model. These high pumping rates lead to efficient mixing profiles in multiple wastewater applications. Variable frequency drive and/or dissolved oxygen sensor result in energy savings. High oxygen transfer and mixing rates reduce horsepower requirements; energy savings can range from 30 to 75%. Grease lubricated tail-bearing with an L10 (subscript) rating of over 100,000 hours and zero dependence on plastic, wastewater lubricated bearings. Zero belt maintenance with direct drive models. Average SAE of 3.0 lbs. O2/hp/hr. Average flow rates over 3,600 gpm/hp. Unique horizontal flow pattern distributes oxygenated water while bringing in oxygen depleted water in a short cycle. Partial mix or complete mix. High solids ponds (Bio-storage, Sludge, Aerobic Digestors). Aerators can completely mix 10' deep ponds. Aerators can be used to partially mix shallow ponds. Reduce overall horsepower usage based on high oxygen transfer and flow rates. Aerators can be cable anchored, levee anchored, or anchored with bollards. Aerators can be equipped with splash shields & rotor covers to reduce aerosol sprays. Only Floating Brush Aerator with a corrosion resistance, sealed drive-train enclosure. The only Floating Brush Aerator built with heave enough materials to last 15-20 years. Custom retrofits for multiple wastewater applications are available. Engineered and designed for predictable and easy routine maintenance. ECS House Industries, Inc. provides the best customer service and support with Service Technicians that have over 75 years combined field service experience. Fabricated from 304L or 316 stainless steel; powder coated or galvanized mild steel units are also available with stainless steel options. Available in 2, 3, 5, 7.5, 15, 20, 25 and 30-HP sizes. Can be equipped with service platforms, splashguards and rotor covers for cold weather environments and to limit aerosol spray. Retro-fit and custom applications available.